Background and Purpose: Proton radiation therapy for non-small cell lung cancer (NSCLC) can minimize dose to adjacent organs at risk (OARs) and potentially reduce morbidity, but limited proton data exist for small cell lung cancer (SCLC). This study compares nonadaptive intensity-modulated radiation therapy (IMRT), adaptive IMRT (AIMRT), nonadaptive proton therapy (PBT), and adaptive proton therapy (APBT) for SCLC. Materials and Methods: Ten consecutive patients with limited-stage SCLC enrolled on an IRB-approved prospective adaptive imaging protocol treated with twice-daily photon radiation therapy to 45 Gy/30 fractions over 3 weeks were analyzed. Patients underwent repeat CT imaging after 10 and 20 fractions. Adaptive plans treated the initial CT scan to 15 Gy, second CT to 30 Gy, and third CT to 45 Gy. IMRT, AIMRT, PBT and APBT dosimetric differences were quantified (n = 40 plans). Results: All plans provided comparable target coverage. From the simulation CT to second adaptive scan, primary and nodal GTVs decreased 54.6% and 51.9%, respectively. For photon plans, AIMRT lowered dose to lungs, esophagus, heart, and ipsilateral brachial plexus. For proton plans, APBT lowered dose to lungs, esophagus, heart, ipsilateral brachial plexus, and cord. PBT reduced dose to lungs and heart compared with IMRT and AIMRT. APBT further reduced doses to lungs, heart, and bilateral brachial plexuses compared with IMRT and AIMRT. Conclusions: Proton therapy maintained optimal tumor coverage while significantly reducing OAR doses compared with photon plans. Adaptive planning provided dosimetric benefits for photons and protons. This study serves as the basis for a planned prospective phase II trial treating limit-staged SCLC patients with proton therapy using adaptive planning, as necessary, based on weekly verification scans. Proton radiation therapy for non-small cell lung cancer (NSCLC) can minimize radiation dose to adjacent organs at risk (OARs), which can potentially reduce toxicities and patient morbidity.5-10 In single-arm studies assessing survival outcomes for proton therapy to treat NSCLC, proton therapy has been reported to improve 2- and 3-year survival rates compared to historically reported rates for photon therapy.11,12 Although early data suggest promising outcomes awith protons for NSCLC, data on proton therapy for SCLC is lacking and limited to a single case series,13 likely due to concerns that rapid tumor volume changes during proton therapy could lead to loss of plan validity and overdosing of OARs. Such changes, therefore, might require adaptive planning if proton therapy were delivered for SCLC. To date, only limited data directly compare different radiation therapy modalities and treatment strategies for SCLC, including the use of proton and particle therapy for SCLC. Additionally, no existing reports assess adaptive photon or proton radiation therapy for SCLC. This is the first study comparing dose-volume histograms (DVHs) of target volumes and normal tissue structures in nonadaptive intensity-modulated radiation therapy (IMRT), adaptive IMRT, nonadaptive proton therapy, and adaptive proton therapy for SCLC to determine whether proton therapy is dosimetrically superior to photon therapy and to assess the benefit of adaptive planning. Ten consecutive patients with limited-stage small cell lung cancer treated at the University of Pennsylvania, Philadelphia, with twice-daily photon radiation therapy were assessed in an Institutional Review Board-approved prospective study in which patients gave informed consent and underwent repeat imaging during radiation therapy. Patients were predominantly female and Caucasian (Table 1). All patients received concurrent chemotherapy and started radiation therapy with cycle 1 (30%) or cycle 2 (70%) of chemotherapy. All patients were treated to 45 Gy in 1.5 Gy twice-daily fractions (30 fractions) over 3 weeks with either 3-dimensional conformal radiation therapy (3DCRT) (50%) or IMRT (50%). Patients underwent replanning 4-dimensional CT scans after their 10th and 20th fractions of radiation therapy to evaluate treatment response. CT data were attained with a slice thickness of 3 mm. To define target and nontarget structures, CT images were imported into photon and proton commercial treatment planning systems (Eclipse Treatment Planning Version 13.0, Varian Medical Systems, Palo Alto, California). OARs and target volumes were contoured on the initial CT data set and each subsequent re-imaging CT data set. Assessed OARs included the spinal cord, lungs, brachial plexus, esophagus, and heart. Gross tumor volume (GTV) was defined as all gross disease determined from bronchoscopy, CT scan (nodes > 1 cm short axis diameter), positron emission tomography (PET) scan (SUV > 3), or pathologic nodal sampling or dissection. Separate GTVs were contoured for primary tumor, designated GTVPrimary, and nodal metastasis, designated GTVNodal. To account for intrafractional motion, an internal GTV was created for each GTV, designated iGTV, by expanding the GTV based on tumor excursion seen on 4D imaging. A 10 mm expansion was added to iGTVPrimary to account for microscopic disease to create clinical target volumes (CTV). For nodal stations involved with tumor, the entire nodal level was included in the CTV, and an additional 3-5 mm margin was added to the involved nodal station. For proton plans, beam range compensators were designed to account for properties of the proton beam and range uncertainties by providing proximal and distal margins relative to each PTV. Blocking was designed to create a lateral margin relative to each PTV, with margins individualized for each patient based on formulas by Moyers et al.17 For the IMRT plan, dose objectives were created for PTVs and OARs. Helios Inverse Treatment Planning (Varian Medical Systems) was used to optimize plans to minimize dose to critical structure by increasing OAR constraints, while maintaining optimal coverage on target volumes and dose homogeneity. Four treatment plans were created for each patient (n = 40 plans): (1) photon IMRT, with treatment planned to the target volumes and normal structures from the initial CT image set to 45 Gy; (2) adaptive photon IMRT, with treatment planned to target volumes and normal structures from the initial CT image set to 15 Gy, second CT obtained after 10 fractions of treatment to 30 Gy, and third CT obtained after 20 fractions of treatment to 45 Gy; (3) passively scattered proton therapy, with treatment planned from the initial CT image set to 45 CGE; and (4) adaptive passively scattered proton therapy, with treatment planned from the initial CT image set to 15 CGE, second CT to 30 CGE, and third CT to 45 CGE. For adaptive IMRT and proton plans, the second and third CTs were fused to the initial CT image set using deformable registration, and new OARs and target volumes were contoured on each of the successive re-planning CT scans. The same expansions to CTVs, PTVs and planning objectives were employed, and plan sums and composite DVHs were generated. Planning was performed to achieve maximum doses (Dmax) to the spinal cord < 36 Gy and brachial plexus < 45 Gy, and the doses to 2/3 of the heart < 20 Gy and 1/3 of the heart < 35 Gy. Lung constraints were mean < 20 Gy, V5 (volume receiving 5 Gy) < 60%, and V20 < 35%, whereas esophageal constraints were mean < 20 Gy and V30 < 50%. The Friedman test, a nonparametric small sample test for comparing multiple treatments across dependent repeated measures, was used to compare the four treatment plans across patients. The Wilcoxon signed rank sum test was subsequently used to conduct post-hoc pairwise comparisons. No multiple testing correction was applied since these were exploratory analyses with small sample sizes. All tests were two-tailed, and results were considered to be statistically significant when p < 0.05. The cohort mean GTVNodal from the initial CT image set obtained before concurrent chemoradiation was 75.9cm3 (range 9.9-320.1cm3) (Table 2). The mean GTVNodal from the second CT image set decreased by 37.6% to 47.4cm3 (5.6-154.7cm3). The mean GTVNodal from the third CT image set decreased an additional 22.9% to 36.5cm3 (2.5-118.1cm3), for an overall reduction of 51.9%. The corresponding mean PTVNodal were 272.2cm3 (106.8-756.8 cm3), 214.5cm3 (82.9-472.1cm3; 21.2% reduction), and 178.9cm3 (62.7-385.8cm3; 16.6% additional reduction, 34.3% total reduction). Similarly, the mean GTVPrimary from the initial CT image set was 37.2cm3 (0.6-162.5cm3), decreased 38.8% to 22.7cm3 (0.3-114.3cm3) at the second CT, and decreased an additional 25.9% to 16.9cm3 (0.1-92.9cm3) at the third CT, for an overall 54.6% decrease. The corresponding PTVPrimary were 232.5cm3 (42.7-607.8cm3), 179.2cm3 (34.4-480.1cm3; 22.7% reduction), and 154.0cm3 (29.9–407.7cm3; 14.3% additional reduction, 33.8% total reduction). IMRT, adaptive IMRT, proton therapy, and adaptive proton therapy plans all provided comparable and acceptable target volume coverage, with no significant difference in coverage to PTVNodal (p = 0.32 to p = 0.92 for all 6 plan comparisons), PTVPrimary (p = 0.44-0.92), and PTVTotal (p = 0.56-0.95) (Figure 1). In all cases, 95% of the PTVTotal was covered by at least 99% of the prescription dose, 99% of the CTVs were covered by the prescription dose, and no point dose exceeded 120% of the prescription dose. Compared with IMRT plans, adaptive IMRT statistically significantly decreased esophagus mean dose and V30 (both p < 0.01), lung mean (p = 0.04) and V20 (p = 0.04), and dose received by 2/3 of the heart (p = 0.03) (Table 3). Adaptive IMRT also trended to lower the mean heart dose (p = 0.06) and significantly lowered the Dmax to the ipsilateral brachial plexus (p = 0.01), but not the contralateral brachial plexus (p = 0.14). There was no statistically significant difference in spinal cord Dmax (p = 0.22), dose received by 1/3 of the heart (p = 0.51), and lung V5 (p = 0.36). Compared with IMRT, proton therapy significantly reduced lung mean (p = 0.03) and V5 (p < 0.01), as well as heart mean and doses to 1/3 and 2/3 of the heart (all p < 0.01) (Figure 1). Proton therapy trended to lower the contralateral brachial plexus Dmax (p = 0.06) but did not significantly reduce the ipsilateral brachial plexus Dmax (p = 0.14). The spinal cord Dmax (p = 0.20), lung V20 (p = 0.44), and esophagus mean (p = 0.39) and V30 (p = 0.84) were not significantly decreased with proton therapy. 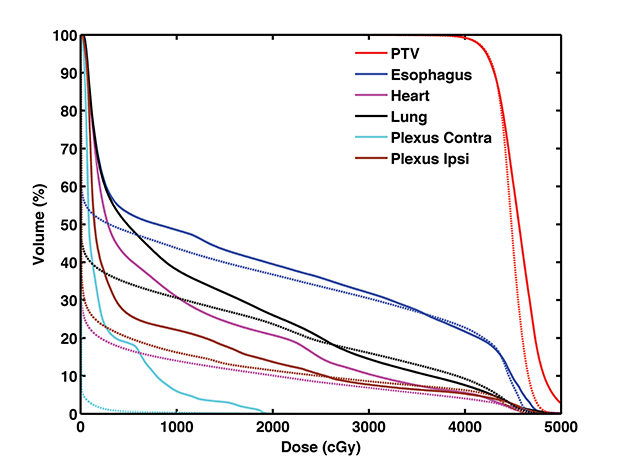 Compared with adaptive IMRT plans, proton therapy significantly lowered lung V5, heart mean, and doses received by 1/3 and 2/3 of the heart (all p < 0.01). The contralateral brachial plexus Dmax (p = 0.06) and lung mean (p = 0.11) trended lower with protons. Ipsilateral brachial plexus (p = 0.58) and spinal cord (p = 0.14) Dmax and esophagus mean (p = 0.96) and V30 (p = 0.28) were not improved with proton therapy. Adaptive proton therapy significantly lowered lung mean and V5, heart mean, and doses received by 1/3 and 2/3 of the heart (all p < 0.01) compared with IMRT. Adaptive proton therapy also significantly reduced the ipsilateral (p < 0.01) and contralateral (p = 0.02) brachial plexus Dmax and trended to lower spinal cord Dmax (p = 0.07), esophagus mean (p = 0.09) and V30 (p = 0.11), and lung V20 (p = 0.06). When compared to adaptive IMRT, adaptive proton therapy significantly reduced spinal cord Dmax (p = 0.02), heart mean and doses to 1/3 and 2/3 of the heart (all p < 0.01), and lung mean (p = 0.03) and V5 (p = 0.01). Adaptive proton therapy also significantly lowered the ipsilateral and contralateral brachial plexus Dmax (both p < 0.01). Esophagus mean (p = 0.28) and V30 (p = 0.88) doses did not differ. Adaptive proton therapy improved the esophagus mean and V30, ipsilateral brachial plexus Dmax, heart mean, and lung mean and V20 (all p < 0.01) compared with nonadaptive proton therapy. Adaptive proton therapy also significantly reduced the lung V5 (p = 0.02) and cord Dmax (p = 0.04) and trended to lower the contralateral brachial plexus Dmax (p = 0.12) and dose received by 2/3 of the heart (p = 0.07). There was no difference in dose received by 1/2 of the heart (p = 0.14). This study showed significant differences in doses to OARs when comparing nonadaptive IMRT, adaptive IMRT, nonadaptive proton therapy, and adaptive proton therapy for treatment of SCLC. Proton therapy significantly reduced dose to the lungs and heart compared with IMRT or adaptive IMRT. Adaptive proton therapy further reduced the doses to the heart and lungs compared with IMRT and adaptive IMRT, and also significantly reduced maximum doses to the bilateral brachial plexuses. When looking at the benefits of adaptive therapy within a radiation particle type, adaptive IMRT improved doses to the lung, esophagus, heart, and ipsilateral brachial plexus compared with nonadaptive IMRT, whereas adaptive proton therapy reduced doses to the lung, esophagus, heart, ipsilateral brachial plexus, and cord compared with nonadaptive proton therapy. This study also demonstrated significant shrinkage of tumor volumes during the course of radiation therapy, including > 50% reductions in GTVs and > 30% reduction in PTVs, with similar magnitude of nodal and primary tumor reductions achieved. In efforts to decrease dose to adjacent normal tissues while maintaining optimal target volume coverage, adaptive radiation planning has been increasingly investigated. Although no published data on adaptive radiation therapy for small cell lung cancer currently exist prior to this report, adaptive radiation therapy for NSCLC has previously been evaluated. By assessing the effects of a 20-28 Gy boost to a shrunken PTV after 40 Gy in 66 patients with stage III NSCLC, Ding et al reported significant sparing of OARs compared to nonadaptive radiation therapy, which the authors reported may allow for dose escalation and an improvement in local control.20 Similar significant reductions in lung doses and an ability to dose escalate were reported in another study of 13 patients with locally advanced NSCLC. This investigation also demonstrated a reduction in mean lung dose of 5.0% with single-plan adaptation in week 3, 5.6% with single-plan adaption in week 5, and 7.9% with adapting the plan after both weeks 3 and 5.21,22 This benefit is in keeping with the even greater benefit seen in our study, in which the mean lung dose was reduced by 5.5% with IMRT and 11.9% with proton therapy with a single-plan adaption after 15 Gy, and by 14.7% with IMRT and 17.6% with proton therapy with a single-plan adaption after 30 Gy. Another study that utilized PET rescanning during the course of treatment to design boost fields for NSCLC demonstrated the potential for significantly escalating doses while sparing OARs.23 Still another study showed that adaptive image-guided radiation therapy methods for NSCLC were optimal in improving PTV coverage and decreasing dose to normal tissues, including significantly reducing the mean lung dose.24 Other studies, however, have showed less benefit to adaptive radiation therapy, including its use for the treatment of stage I NSCLC with stereotactic body radiation therapy (SBRT).25 However, unlike the dramatic reduction in tumor volume demonstrated during the course of treatment for SCLC in the current study, a significant tumor volume reduction would not be expected during the short course of SBRT. Although some radiation oncologists continue to treat SCLC with 3D-CRT, as was done in Intergroup 0096,4 IMRT-based radiation therapy with concurrent chemotherapy for limited-stage SCLC has become increasingly utilized to decrease dose to OARs compared to 3DCRT, and IMRT is being prospectively evaluated for SCLC in the Netherlands.27 In this study, photon plans were delivered with IMRT to maximize tumor coverage and minimize OAR dose. It is possible that the magnitude of benefit demonstrated in this study with proton therapy over photon therapy would have been even greater had the photon plans employed 3DCRT. Furthermore, as the entire treatment course with twice daily radiation therapy was completed in 3 weeks, it is possible that greater target volume shrinkage and further reductions of dose to OARs would have been demonstrated if radiation therapy was administered once daily over 6-8 weeks instead of twice daily. Also, as 7 of the 10 patients received one cycle of chemotherapy prior to beginning radiation therapy, the magnitude of tumor volume reduction and OAR sparing may have been even greater if only chemotherapy-naïve patients were assessed. As patients treated with once-daily radiation therapy or starting radiation therapy with cycle 1 of chemotherapy may have an even greater magnitude of benefit for adaptive therapy, adaptive planning may be even more imperative when treating such patients with proton therapy. Furthermore, all proton plans were performed using passively scattered proton therapy. It is possible that the benefit demonstrated in this study with proton therapy over photon therapy would have been even greater had the proton plans employed pencil-beam scanning proton therapy instead of passively scattered proton therapy. Additionally, all doses reported for tumor and OARs were based on the clinical proton treatment planning system. The accuracy of proton dose in a heterogeneous environment like the lung is limited due, in part, to degradation of the lateral penumbra.28-30 As a result, the reported values may be overestimated for target dose and underestimated for dose to normal lung, and reanalysis with Monte Carlo-based dose calculation might more accurately describe the true doses to these volumes.28,31 However, the magnitude of the effects seen in this study, including the benefit of proton therapy over IMRT and the benefit of adaptive therapy over nonadaptive therapy, would be expected to remain significant and largely proportional regardless of the dose calculation method used and out-of-field dose inaccuracies. Additionally, given the limited data on adaptive planning in lung cancer, caution must be taken when clinically performing adaptive therapy by shrinking the target volumes, as viable microscopic disease might remain in the original treatment volume despite a strong initial response to chemoradiation. We mitigated this concern, in part, by using the same expansions to CTVs and PTVs in the adaptive plans that were used in the initial plans and by using the same field arrangements in the adaptive plans that were used in the initial plans to allow for dose delivery via beams already traversing these areas of potential microscopic residual disease. Furthermore, findings from two large studies, including a 494-patient cooperative group study, suggest that the radiation therapy treatment of smaller volumes of disease following an initial response to therapy for SCLC is not associated with reduced local control or overall survival.32-33 Lastly, the statistical results in this study should be interpreted with caution since the sample size was limited, as this was an exploratory analysis intended to provide evidence supporting the initiation of a planned prospective clinical trial. This study demonstrated a rapid shrinkage of tumor volumes during the course of radiation therapy for SCLC, which allowed for adaptive plans to be dosimetrically superior to nonadaptive plans for both photons and protons. Adaptive plans may be of more critical importance for proton therapy, and verification scans should be performed during treatment to ensure continued plan validity. Adaptive planning for proton therapy may be further facilitated using cone-beam computed tomography and deformable registration.34 When compared with photon therapy, proton therapy allowed for the maintenance of optimal tumor coverage while significantly reducing dose to critical normal structures like lungs and heart. With decreased doses delivered to OARs, patients receiving proton therapy may experience fewer radiation-induced side effects. Prospective clinical trials are needed to determine if the dosimetric superiority of proton therapy can result in less toxicity for patients with limited-stage SCLC. Future studies should also focus on the feasibility and benefit of pencil-beam scanning and intensity-modulated proton therapy (IMPT) for SCLC to further reduce dose to OARs, including the esophagus.35,36 The findings in this study serve as the basis for a planned phase II trial assessing toxicities in limit-staged SCLC patients treated with proton therapy using adaptive planning, as necessary, based on weekly verification scans. Warde P, Payne D. Does thoracic irradiation improve survival and local control in limited-stage small-cell carcinoma of the lung? A meta-analysis. J Clin Oncol. 1992;10:890-895. Pignon JP, Arriagada R, Ihde DC, et al. A meta-analysis of thoracic radiotherapy for small-cell lung cancer. N Engl J Med. 1992;327:1618-1624. Takada M, Fukuoka M, Kawahara M, et al. Phase III study of concurrent versus sequential thoracic radiotherapy in combination with cisplatin and etoposide for limited-stage small-cell lung cancer: results of the Japan Clinical Oncology Group Study 9104. J Clin Oncol. 2002;20:3054-3060. Turrisi AT 3rd, Kim K, Blum R, et al. Twice-daily compared with once-daily thoracic radiotherapy in limited small-cell lung cancer treated concurrently with cisplatin and etoposide. N Engl J Med. 1999;340:265-271. Simone CB 2nd, Rengan R. The use of proton therapy in the treatment of lung cancers. Cancer J. 2014;20:427-432. Roelofs E, Engelsman M, Rasch C, et al. Results of a multicentric in silico clinical trial (ROCOCO): comparing radiotherapy with photons and protons for non-small cell lung cancer. J Thorac Oncol. 2012;7:165-176. Chang JY, Jabbour SK, De Ruysscher D, et al. International Particle Therapy Co-operative Group Thoracic Subcommittee. Consensus Statement on Proton Therapy in Early-Stage and Locally Advanced Non-Small Cell Lung Cancer. Int J Radiat Oncol Biol Phys. 2016;95:505-516. Nichols RC, Huh SH, Hoppe BS, et al. Protons safely allow coverage of high-risk nodes for patients with regionally advanced non-small-cell lung cancer. Technol Cancer Res Treat. 2011;10:317-322. Wink KC, Roelofs E, Solberg T, et al. Particle therapy for non-small cell lung tumors: where do we stand? A systematic review of the literature. Front Oncol. 2014;4:292. Sejpal S, Komaki R, Tsao A, et al. Early findings on toxicity of proton beam therapy with concurrent chemotherapy for nonsmall cell lung cancer. Cancer. 2011;117:3004-3013. Xiang ZL, Erasmus J, Komaki R, et al. FDG uptake correlates with recurrence and survival after treatment of unresectable stage III non-small cell lung cancer with high-dose proton therapy and chemotherapy. Radiat Oncol. 2012;7:144. Nakayama H, Satoh H, Sugahara S, et al. Proton beam therapy of Stage II and III non-small-cell lung cancer. Int J Radiat Oncol Biol. Phys 2011;81:979-984. Colaco RJ, Huh S, Nichols RC, et al. Dosimetric rationale and early experience at UFPTI of thoracic proton therapy and chemotherapy in limited-stage small cell lung cancer. Acta Oncol. 2013;52:506-513. Chang JY, Komaki R, Wen HY, et al. Toxicity and patterns of failure of adaptive/ablative proton therapy for early-stage, medically inoperable non-small cell lung cancer. Int J Radiat Oncol Biol Phys. 2011;80:1350-1357. Koay EJ, Lege D, Mohan R, et al. Adaptive/nonadaptive proton radiation planning and outcomes in a phase II trial for locally advanced non-small cell lung cancer. Int J Radiat Oncol Biol Phys. 2012;84:1093-1100. Gerweck LE, Kozin SV. Relative biological effectiveness of proton beams in clinical therapy. Radiother Oncol 1999;50:135-42. Moyers MF, Miller DW, Bush DA, Slater JD. Methodologies and tools for proton beam design for lung tumors. Int J Radiat Oncol Biol Phys. 2001;49:1429-1438. Giaddui T, Chen W, Yu J, et al. Establishing the feasibility of the dosimetric compliance criteria of RTOG 1308: phase III randomized trial comparing overall survival after photon versus proton radiochemotherapy for inoperable stage II-IIIB NSCLC. Radiat Oncol. 2016;11:66. Kesarwala AH, Ko CJ, Ning H, et al. Intensity-modulated proton therapy for elective nodal irradiation and involved-field radiation in the definitive treatment of locally advanced non-small-cell lung cancer: a dosimetric study. Clin Lung Cance.r 2015;16:237-244. Ding XP, Zhang J, Li BS, et al. Feasibility of shrinking field radiation therapy through 18F-FDG PET/CT after 40 Gy for stage III non-small cell lung cancers. Asian Pac J Cancer Prev. 2012;13:319-323. Guckenberger M, Wilbert J, Richter A, et al. Potential of adaptive radiotherapy to escalate the radiation dose in combined radiochemotherapy for locally advanced non-small cell lung cancer. Int J Radiat Oncol Biol Phys. 2011;79:901-908. Guckenberger M, Richter A, Wilbert J, et al. Adaptive radiotherapy for locally advanced non-small-cell lung cancer does not underdose the microscopic disease and has the potential to increase tumor control. Int J Radiat Oncol Biol Phys. 2011;81:275-282. Feng M, Kong FM, Gross M, et al. Using fluorodeoxyglucose positron emission tomography to assess tumor volume during radiotherapy for non-small-cell lung cancer and its potential impact on adaptive dose escalation and normal tissue sparing. Int J Radiat Oncol Biol Phys. 2009;73:1228-1234. Harsolia A, Hugo GD, Kestin LL, et al. Dosimetric advantages of four-dimensional adaptive image-guided radiotherapy for lung tumors using online cone-beam computed tomography. Int J Radiat Oncol Biol Phys. 2008;70:582-589. Haasbeek CJ, Lagerwaard FJ, Cuijpers JP, et al. Is adaptive treatment planning required for stereotactic radiotherapy of stage I non-small-cell lung cancer? Int J Radiat Oncol Biol Phys. 2007;67:1370-1374. Simone CB 2nd, Ly D, Dan TD, et al. Comparison of intensity-modulated radiotherapy, adaptive radiotherapy, proton radiotherapy, and adaptive proton radiotherapy for treatment of locally advanced head and neck cancer. Radiother Oncol. 2011;101:376-382. ClinicalTrials.gov, Search for “Clinical Trials.” http://www.clinicaltrials.gov/. Accessed October 20, 2016. Grassberger C, Daartz J, Dowdell S, et al. Quantification of proton dose calculation accuracy in the lung. Int J Radiat Oncol Biol Phys. 2014;89:424-430. Knöös T, Ahnesjö A, Nilsson P, Weber L. Limitations of a pencil beam approach to photon dose calculations in lung tissue. Phys Med Biol. 1995;40:1411-1420. Chetty IJ, Curran B, Cygler JE, et al. Report of the AAPM Task Group No. 105: Issues associated with clinical implementation of Monte Carlo-based photon and electron external beam treatment planning. Med Phys. 2007;34:4818-4853. Schuemann J, Giantsoudi D, Grassberger C, et al. Assessing the Clinical Impact of Approximations in Analytical Dose Calculations for Proton Therapy. Int J Radiat Oncol Biol Phys. 2015;92:1157-1164. Kies MS, Mira JG, Crowley JJ, et al. Multimodal therapy for limited small-cell lung cancer: a randomized study of induction combination chemotherapy with or without thoracic radiation in complete responders; and with wide-field versus reduced-field radiation in partial responders: a Southwest Oncology Group Study. J Clin Oncol. 1987;5: 592-600. Liengswangwong V, Bonner JA, Shaw EG, et al. Limited-stage small-cell lung cancer: patterns of intrathoracic recurrence and the implications for thoracic radiotherapy. J Clin Oncol. 1994;12:496-502. Veiga C, Janssens G, Teng CL, et al. First Clinical Investigation of Cone Beam Computed Tomography and Deformable Registration for Adaptive Proton Therapy for Lung Cancer. Int J Radiat Oncol Biol Phys. 2016;95:549-559. Chang JY, Li H, Zhu XR, et al. Clinical implementation of intensity modulated proton therapy for thoracic malignancies. Int J Radiat Oncol Biol Phys. 2014;90:809-818. Lin L, Kang M, Huang S, et al. Beam-specific planning target volumes incorporating 4D CT for pencil beam scanning proton therapy of thoracic tumors. J Appl Clin Med Phys. 2015;16:5678. Lu D, Xanthopoulos E, Dixit N, James P, Mitra N, Rengan R, Hahn SM, Both S, Simone CB II. Comparison of intensity-modulated radiation therapies. Appl Rad Oncol. 2016;5(4):20-27. Ms. Lu is a medical student, Ms. Dixit is a medical physicist, Mr. James is a dosimetrist, and Dr. Levin is associate professor, Department of Radiation Oncology, and Dr. Mitra is professor, Department of Biostatistics & Epidemiology, Hospital of the University of Pennsylvania, Philadelphia. Dr. Xanthopoulos is a radiation oncologist, Department of Radiation Oncology, Columbia University Medical Center, New York, NY. Dr. Rengan is associate professor, Department of Radiation Oncology, University of Washington, Seattle. Dr. Hahn is professor and chair, Division of Radiation Oncology, The University of Texas MD Anderson Cancer Center, Houston. Dr. Both is associate attending physicist, Department of Medical Physics, Memorial Sloan Kettering Cancer Center, New York, NY. Dr. Simone is associate professor, Department of Radiation Oncology, University of Maryland, Baltimore, MD.